Securitek guarantee to have a guard on site within an hour of your call. We have called Securitek on numerous occasions it could be 6pm or 4am and they respond the same. Most professional service we have encountered. Securitek are a “one stop shop” for all our security needs. 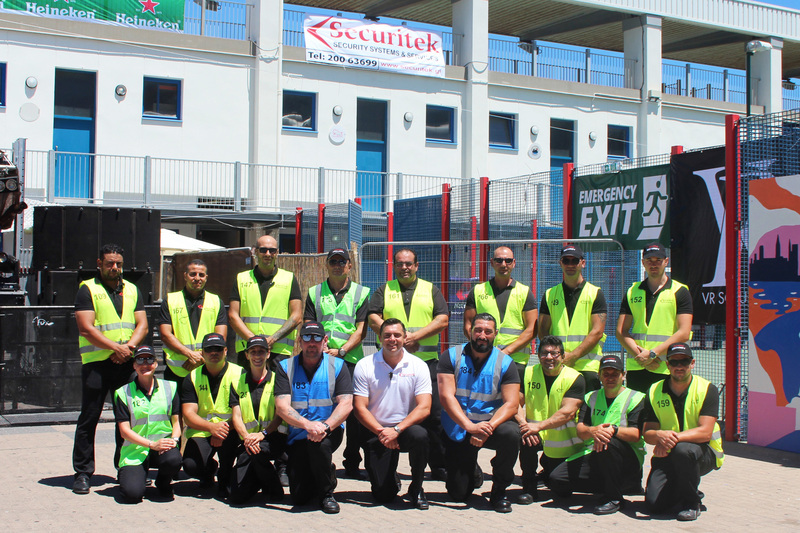 Securitek have supplied and fitted CCTV, Access control with turnstiles, Intruder Alarms, Access cards and quality professional guards to a number of our sites across Gibraltar. It’s great to have a partner in business who simply manages our total security requirements. Securitek’s cost effective leasing solutions. Securitek not only gave us a cost effective leasing option so we had no big layout of funds, they gave us complete confidence in their systems supplied or they wouldn’t have funded the supplying, fitting and maintenance of their systems on a set monthly charge over 1 year…refreshing to see complete professionalism. Securitek saved us at least 40% on our original budget. Securitek demonstrated that due to their innovative approach to security and the fact they have their “finger on the pulse” of new technology, there is always a solution with Securitek …Fantastic. Securitek are fast acting and extremely proactive in their approach to our requirements, always one step ahead and thinking on their feet. Securitek – from the Top to the Bottom. From senior Management or the engineers fitting our systems, or the guards protecting our business Securitek`s whole team are extremely well organised and always available to help. We called Securitek at 3pm on a Friday afternoon, the guard was on site at 5pm looking smart and clean shaved. The Operations Manager even had carried out a Risk Assessment of site and drafted Assignment Instructions for guard’s duties and all of this within 2 hours – Exceptional service. I have had the opportunities of seeing for myself the professionalism, very friendly down to earth services and customer care given by Securitek Ltd to their clients. Both Directors, Mr Poggio and Mr Yeo are two mild mannered, very obliging individuals who have shown to me that they take their jobs very seriously indeed. In view of my experiences with this company it pleases me greatly to recommend their services, be it their Security Guards Division or their CCTV Division. I have seen the services they provide on both these fronts, the former being the excellent service currently being provided at Midtown Car Park and the latter being the CCTV Cameras that were installed in the 20 MAN Buses, and associated back up service, when I was the Manager of the Gibraltar Bus Company Ltd. I also have to mention that their rates are very completive and, beyond any shadow of a doubt, you will find that if you award them the tender they will provide a lot of assistance that you will not be charged for, obviously within reason. Securitek Ltd has been on the Ocean Village premises as Security Company for the Night shifts and coverage of Day shifts since February this year and I can say that their performance is outstanding compared with previous suppliers. Further Securitek Ltd is since many years responsible for the money transport and maintenance of the payment equipments and entrance barriers in the OV carpark and here as well they are doing a good and reliable job. In our Marinanthey have installed a new CCTV · system and this is working according our high expectations and specifications. O can sincerely recommend Securitek for any of above mentioned tasks. I have been contracting their services for CCTV for the last two years. In all that time their service has been second to none. Their equipment is excellent and their service, on the odd occasion that a malfunction occurs, is swift and sure. Securitek staff are helpful and polite and mindful of the needs of our organisation. In short, I recommend their services wholeheartedly and I am certain you will not regret contracting them. This is to certify that Securitek Ltd have been covering security tasks for the Caleta Hotel for almost a decade. We use Securitek’s services for CCTV camera systems, general security around the Hotel for events, cash in transit and test purchasing. Securitek have also provided life guards for our swimming pool for five seasons. We have always found Securitek to be professional and efficient, we would have no hesitation to recommend them. We have been working with Securitek Ltd since April 2015 when our GBCL decided to install security equipment in our fleet of buses. Initially Securitek Ltd was asked to provide CCTV and GPS in our initial batch of 20 buses. Such as the expertise and the commitment shown by Securitek Ltd to honour the contract within the time limit, we decided to award a further contract for the following batch of 6 buses. The services provided by Securitek Ltd, both in the whole fleet of buses and in the depot, have been outstanding. The systems are also revised on a weekly bas. is by Securitek1s engineers and any problems are dealt with immediately. I have no hesitation whatsoever in recommending Securitek Ltd to any prospective clients as they have proved to be a reliable and dependable asset to us.